In recent times, the media has been under attack. Those attacks were the subjects of the 2018 Native American Journalists Association (NAJA) Conference, held July 18 -21 at the InterContinenal Hotel in downtown Miami, Florida. With social media and other electronic sources, journalism has more competition than ever. Also, the media’s credibility has been under attack for some time, lending to a popular phrase of “fake media.” Journalists around the world have been attacked and imprisoned to prevent the truth from being reported to the public. 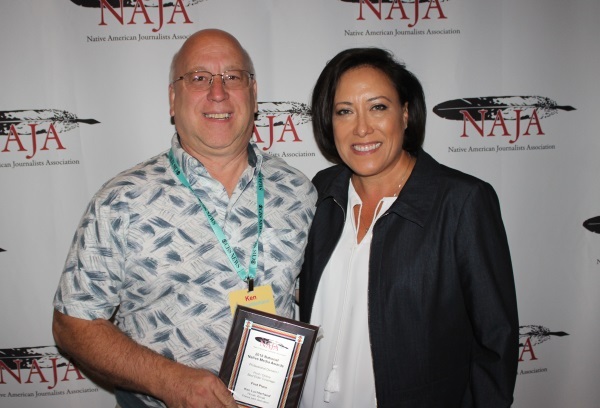 NAJA combined forces with the National Association of Hispanic Journalists (NAQHJ) for sessions that concern professionals in the fields of print, television, radio and electronic media. Reporter Ken Luchterhand from the Hocak Worak attended and represented the Ho-Chunk Nation at the event. The conference was concluded Saturday evening with the NAJA National Native Media Awards Banquet and President’s Reception. Awards were presented at the banquet for excellence in print, online, television and radio fields. Also, “Sioux tribes seek injunction,” earned Wohlers a third place in News Photo. Ken Luchterhand took first place for Best Elder Coverage with “France park dedication,” and a third place for Best Environmental Coverage for his article, Rights of “Nature examined.” The Best Elder Coverage award was sponsored by AARP (American Association of Retired Persons). During the conference sessions, an increasing emphasis was given to electronic digital journalism, which includes social media, digital video, and podcasts. “Now more than ever, the readers, viewers, and digital users are turning to multiple platforms to get their news of the day, hour, and minute. Our industry has changed since NAHJ first started in 1984 and so we must change and learn the different technologies,” said NAHJ President Brandon Benavides. One of the main sessions that drew a large crowd was “Violence Against Journalists,” in which journalists from many countries, including the United States, Mexico, Venezuela, Brazil, and Columbia, told stories how the government constantly attacked the press in attempts to suppress the truth from being told. Many times, journalists have been threatened to be harmed by public officials if there is a chance their illegal acts will become public. Representatives from Smoke Signals, a publication of the Grand Ronde tribe in Oregon, told about their efforts to produce a newspaper that was independent of the tribal government. They told about their struggles and successes in developing the news source, which was immediately accepted by the members of the tribe and gained support of the government. Being independent allows the paper to report on the government without being censored or restrained in any way, said Smoke Signals editor Dean Rhodes. They were able to report on the upheaval in the Member Services Department, which might not have been allowed before they became independent. “For many years, the tribal newspaper was supervised by an employee who directly reported to Tribal Council. I think we can all guess the pernicious effect that had on a free press,” Rhodes said.